June 14th, 1800 near Marengo, Piedmont, Italy, seventy kilometers north of Genoa. French army (24,000 to 28,000 men, 15 cannons), under First Consul Napoleon Bonaparte. Austrian army (27,000 to 30,000 men, 100 cannons), under General Michael Friedrich Benedikt von Melas. "Battle of Marengo" (detail). Painted 1802 by Louis-François Lejeune. Spinetta Marengo is a Piedmontese hamlet along the Bormida , a tributary of the Po river. It was here that Napoleon Bonaparte's enemy surprised him while his forces were spread out looking for them. Generals Jean François Cornu de la Poype and Louis Charles Antoine Desaix had been sent to the north and south to stop the Austrians on the road to Milan and Genoa. Orders to return were dispatched later in the day but to no avail: those for La Poype arrived too late, while Desaix was unable to intervene until late afternoon. The Austrian army of 30,000 men and 100 cannons was under the command of General Michael Friedrich Benedikt von Melas. They began their attack around 9 a.m. in the vast territory stretching from Spinetta in the west to Castelceriolo in the north and San Giuliano Vecchio in the east. Bonaparte, who had established his headquarters on a farm in Torre Garofoli several kilometres east of San Giuliano, was surprised by this strategy. He immediately began to ready his 22,000 soldiers and 15 artillery cannons. 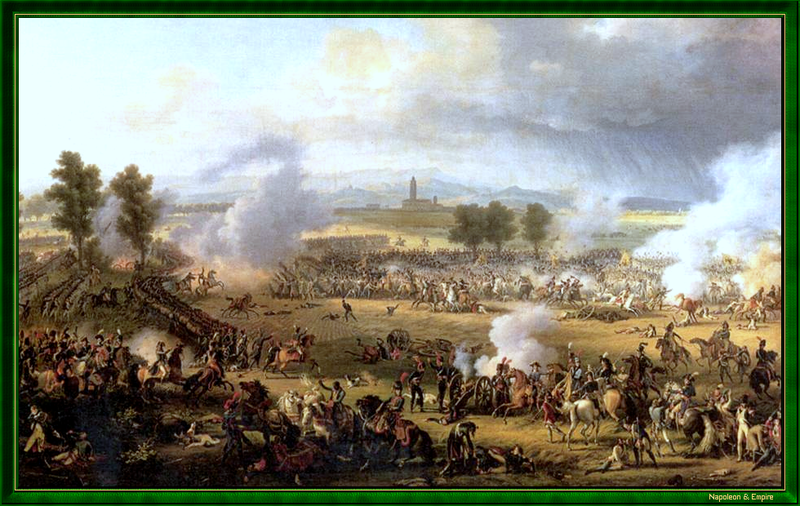 General Victor's troops made up the centre and left flank while those commanded by Jean Lannes took the right. The enemy advanced in three columns. After several hours of bloody combat under heavy musket and artillery fire, the French situation suddenly became critical in the early afternoon. General Victor, lacking ammunition, was forced to retreat and abandon his cannons. To avoid being surrounded by the enemy, Lannes also fell back. Bonaparte had to personally intervene in the battlefield to reassure the troops. At this point, an orderly retreat toward the village of San Giuliano was possible. Feeling assured of victory, General Melas left General Kaim in command in order to report his success to the German Emperor, Francis II (a member of the Habsburg family) who was following the events in the nearby city of Alessandria. 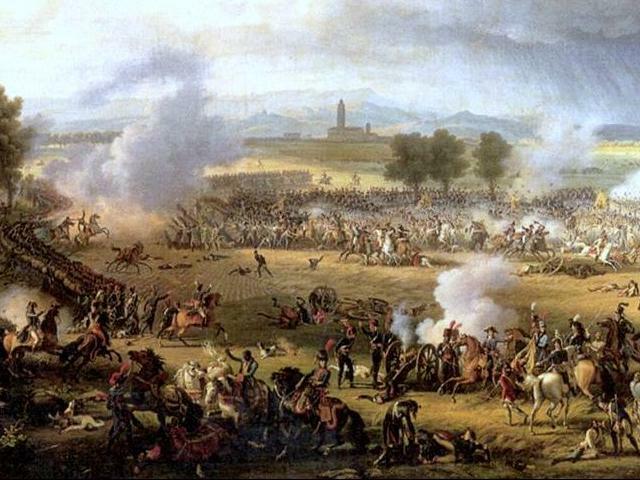 However, since the Austrians had failed to sufficiently pursue the French, they were able to join Desaix's forces who were preparing for battle in the village of San Giuliano Vecchio. The first battle is lost, but we have time to win the next , declared Desaix, and Bonaparte immediately ceased the retreat. With the few pieces of artillery available to him combined with Desaix's cannons, Auguste Frédéric Louis Viesse de Marmont began to cut down the Austrian vanguard who broke ranks and fled in surprise. As Desaix began to advance with his customary vigour, he was almost immediately killed by a bullet to the heart. In the confusion, his troops hesitated without a commander. Luckily, François Étienne Kellermann ordered his cavalry to advance in the nick of time toward the left flank of the enemy in the direction of Cascina Grossa , to the west of San Giuliano. Three thousand Austrian grenadiers and their general were cut down or taken prisoner. The rest of the Habsburg army, caught off-guard by this swift counterattack, panicked and began to flee across the Bormida bridge causing heavy casualties. By the evening June 14, 1800 the French were in control of the battlefield. They had suffered 6,000 dead or wounded. The Austrians, however, had fared much worse: 9,400 dead or wounded and 8,000 taken prisoner. Subsequent reports of the battle differ on the timing of the key phases. According to Jean-Jacques Regis de Cambaceres, the repercussions and consequences surpassed even the most optimistic predictions. Having risked his life and power in the campaign, Bonaparte was able to gain a significant political advance of which he would make full use. Even his opponents felt obliged to commend the First Consul for his audacity. Nothing shares the brilliance of Marengo , said Madame de Staël adding in reference to the substantial personal risks taken by Napoleon during the operation, One must admit that risking everything already obtained is more worthy of praise than the risks taken on the path to greatness. In Spinetta Marengo, a museum (renovated and expanded in 2009) houses artefacts from the battle. A standing statue of Napoleon Bonaparte can be found in the surrounding area as well as a column topped by a bronze eagle that was first installed in 1801, removed by the Austrians in 1814 and then returned in 1918. The battlefield of Marengo, where Napoleon Bonaparte defeated the Austrians on June 14, 1800, during the Second Campaign of Italy. However, French General Desaix was mortally wounded at the end of the battle.